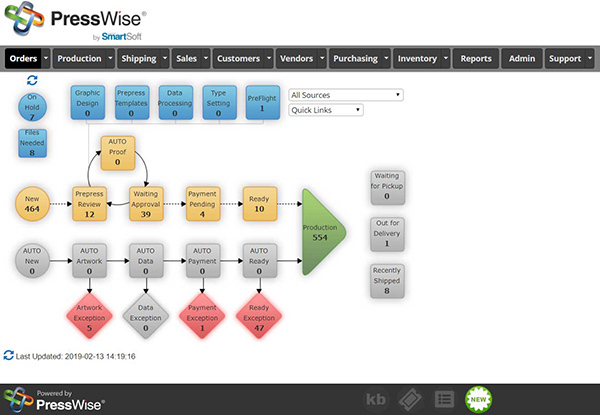 The PressWise print order processing and management system makes it easy to control any level of business flow. Whether you are just starting to build your business or have a thriving shop with thousands of orders per week, you’ll find the PressWise design very natural, intuitive and versatile. Auto Job Workflow – As printers grow their business, they quickly realize that the old methods (manual job dockets, etc.) can’t keep pace with the greater demand for smaller orders. The PressWise workflow enforces best practices, enabling workers to “manage by exception” rather than requiring them to touch each job multiple times before it’s completed. This method allows eligible orders to flow directly from the shopping cart, through automated order validation, and on to production, without human intervention. Orders are handled smoothly, whether you produce the work in-house or outsource it. Custom Job Workflow – Custom orders that need inspection are automatically staged for CSRs and pre-press staff to take action. The tools workers need are just a click away: credit card processing, email messaging, estimating, digital asset management, proofing controls, a QuickEdit tool that lets you fix typos in artwork, and much more. Without having a tool like PressWise that enables us to batch process and automate the workflow, it’s doubtful we would be profitable on digital projects. Instead, we are more profitable on digital than ever before!